Vincent & Casey will be running their maiden 200km ultra-marathon to raise fund for Hospis Malaysia. 200km Fund-Run. We call it. Not a fun-run, 200km really not 'fun' at all for us, as we ain't no elite nor seasoned runners. We are just regular people who found passion in running. 200km is difficult, but not impossible. Lot of pains and sufferings will be anticipated in our coming 200km run, but all these can't compared with those faced by patients with life-limiting illnesses. We are especially motivated because our love of running will benefit a worthy cause to community. 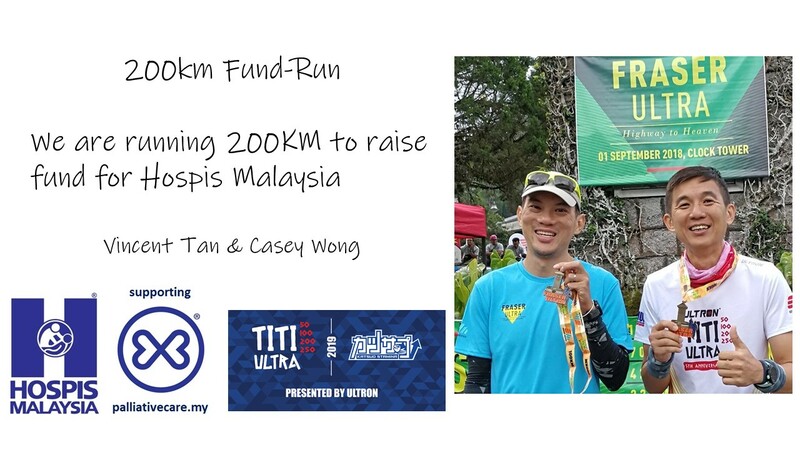 Hence, on 15th March 2019, we will be running 200km in the coming Katsuo Stamina TITI Ultra Marathon 2019, to raise fund for Hospis Malaysia. What we raise from this page will go directly to Hospis Malaysia. Hospis Malaysia is a charitable organisation that offers professional palliative care to those with serious illnesses (such as cancer, AIDS, organ failure or progressive neurological conditions.) Their clinical team makes home visits to assess patients and help with the problems related to a serious illness, be they physical, psychological or social. Their care is provided free of charge. We would greatly appreciate for your donation of any amount (although there is a minimum amount of RM 10 in this Fundraising Page. Please also note that this Fundraising Page apply 7% processing fees). Sharing our page on any social network will helps too!